The 1990s were a wild time for pop culture and trivia. As someone born in 1989 (please save the eyerolls elder-devs; we all have no choice in our release date on this Earth) the late 90s bring back overwhelming nostalgia of Nicktoons, Disney Channel Original movies, and very bizarre straight to VHS videos from the Olsen Twins. Of course, back in our day, we didn’t have Hulu & Netflix… we had cable TV. Which meant commercials. Which meant brainwashing us into needing the newest coolest toy being advertised to us between episodes of Rocko’s Modern Life. True fact: I don’t have my partner of 3 years’ cell phone number memorized, but I can sing every lyric in this Nano Baby ad (among many others). Ok, to be fair, most of the lyrics are “Nano”… BUT STILL. With the 2000s and Y2K just around the riverbend (yes, Pocahantas was ‘95), it seemed like every new toy was trying to be the newest gadget that kids of the new millennium would beg their parents for. Seemingly overnight we went from American Girl dolls, Polly Pockets/Might Maxes, and Beanie Babies to Teddy Ruxpins, Tomagotchis, and Poo-Chis. 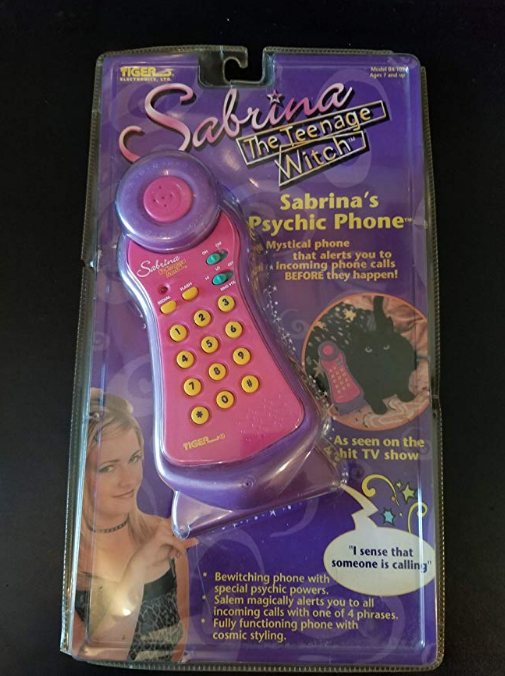 I vividly remember having my mind blown by a Sabrina the Teenage Witch Psychic Phone that rang by having Salem’s voice alert you to incoming calls before they happen… I of course now realize that the 1st ring was Salem… but still I WAS BLOWN AWAY BY THE TECHNOLOGY, OK? GIMMIE A BREAK I THOUGHT IT WAS MAGIC AND I WAS A YOUTH. This is available on Amazon for $75 right now lolol. Which brings us to the Furby… the hottest toy of 1998. Seriously, I remember my mom and I having to get to Toys R Us at 7am to get this little dude. As an only child, I loved my Furby like nothing else. Who can forget the struggle of having to shut your Furby in a towel closet when it wouldn’t shut up, and you needed to make it “go to sleep” by storing it in a dark place? Or when, later that day, your dad opened the towel closet before heading out to the hot tub and was absolutely terrified that someone was in the house when a shrill voice exclaimed “YOU FOUND ME”? Needless to say, Furbies were popular and with good reason. Me rn, writing this article after having tea and taking my Adderall. The 1st generation Furby of my era had an infrared port on it’s forehead (allowing it to communicate with your other Furbies). Then came Furby Babies, Furby Friends (in college I purchased an E.T. 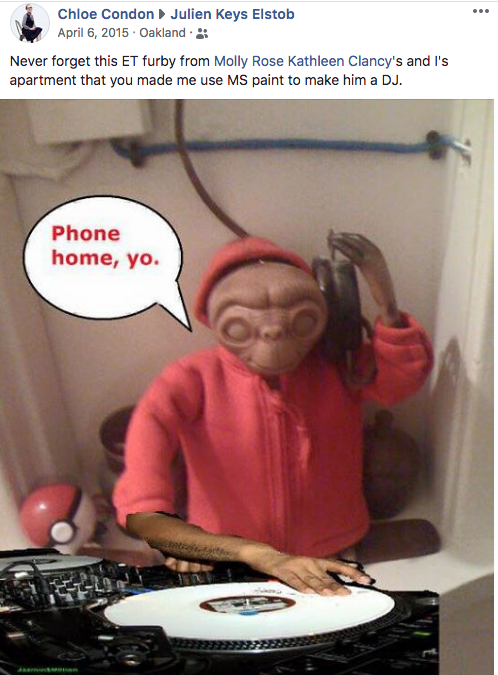 one, pictured below DJing- thanks to my amazing college MS Paint skills), a bunch of weird “Emoto-Tronic” Furbies, 2012 Furby, Furby Party Rockers, Furby Boom, Furby Boom Crystal, Furbacca (yes, a Chewbacca Furby), and most recently in 2016 Furby Connect. With each new generation of Furby, new features and technologies were added such as apps and LCD screens. My obsession with 90s toys has come back as I have started eBaying my childhood toys. 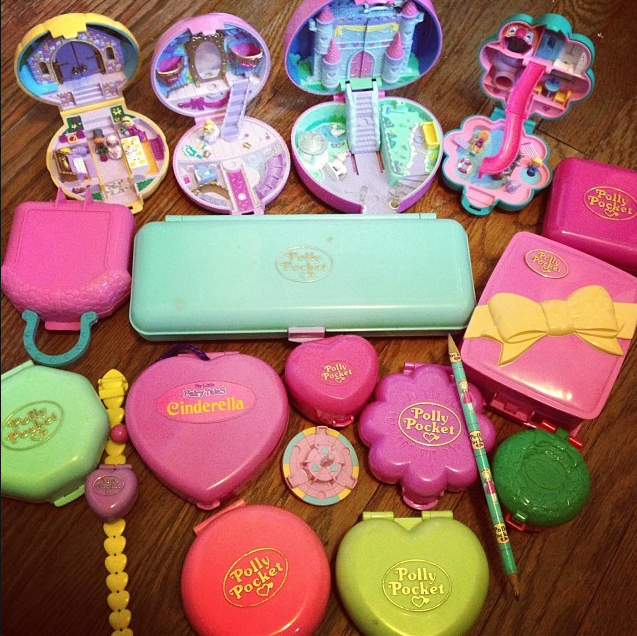 I kid you not, my vintage trolls are now selling for $300+ right now, and I made about $300 by selling my Polly Pockets in 2016 (it was great pocket money for Hackbright Academy- no pun intended). While I haven’t stumbled across my original Furby yet, I still have my original Teddy Ruxpin and a HUGE box of McDonalds/Burger King toys. Earlier this year, while touring an event space for Sentry.io’s Sentry Scouts, a space we viewed had some amazing taxidermy Furby art pieces by Wonderful Idea Co. on display from a previous event. The bunny one on their site is pretty great, too. As someone whose aesthetic is quirky-crafter-who-loves-reclaimed-wood-but-also-learned-to-code® , it had been on my to-do list to make one of my own for a long long time. But, like many side projects, I kept putting it off. But y’all, I finally did it. I googled “furby hack”, found this video, and used part of my troll doll earnings to purchase a used Furby Connect. So, below are some basic instructions on how to do some very basic fun things with your Furby. This was all made by a human on the internet who goes by Jeija who has a YouTube video as well as a GitHub repo that I use in this walkthrough. You’ll want to have some basic programming knowledge before attempting any of this. If you’re brand new to programming (or have no idea what a terminal is), find a buddy to come over who has their dev environment set up and doesn’t mind installing Node+XCode to have a Furby hacking day and help troubleshoot with you. Maybe you can pay them back in Chuck E. Cheese tickets or something. A Furby Connect (this tutorial won’t work with other Furby toys- make sure it’s a Connect). I bought mine on eBay. Pro-Tip 💖: I would reccomend starting with your Furby OFF. And by “OFF” I mean, take one of his batteries out. Otherwise, he’s going to be whining for attention the whole time you do set-up. 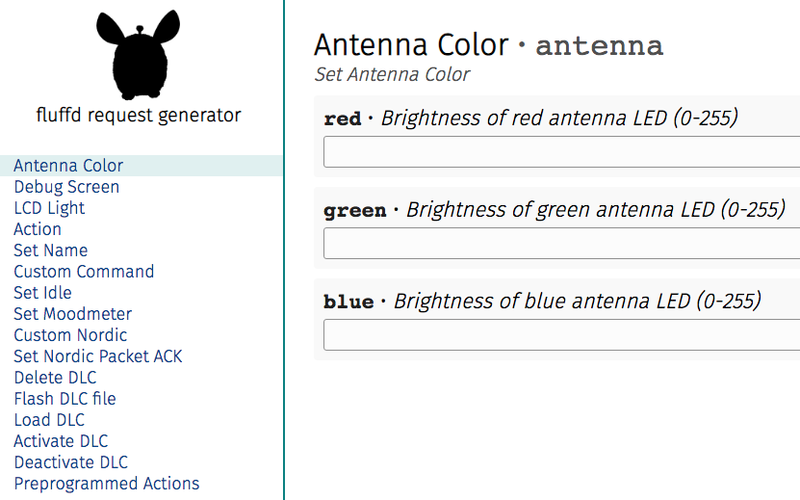 “fluffd” will be what we use to interact with our Furby and control it via BLE from your Linux macOS, FreeBSD, or Windows computer simpler. It’s based on node.js and uses noble in the background. You will need node.js version 7.0 or later. The installation instructions are pretty simple, but since I started this program with an older computer I own (between funemployment and starting at Microsoft next week 🎉) that I recently factory reset, I ran into some issues with not having XCode already installed. So, learn from my mistake! Execute npm install xpc-connection to install XPC Connection bindings for node.js. XPC is macOS-specific, so this is not required on other platforms. Ok, now you will need to turn your Furby on. Otherwise, it won’t be able to connect. Jeija has provided some great documentation in their repo for all of Furby’s actions, names, DLC formats (this will come in handy if/when you want to add your own custom audio to Furby), and even a Furbish dictionary so you can figure out WTF “Doo-oo-tye?” means (spoiler alert, it translates to “Wassup?”). There are 2 sections that I found to be easy and fun to play around with. 3, 3, 0, 11: Have your Furby tell you to “Take it Easy” and then fart really long. 10, 0, 1, 0: Make Furby yodel. 10, 1, 1, 0: Make your Furby cry and say YOLO (lol??). 17, 0, 0, 5: Make Furby beatbox. 24, 1, 4, 2: Make Furby fart to the tune of “It Don’t Mean a Thing” and then say “JAZZ FART”. 51, 0, 0, 1: Make Furby quote JAWS. 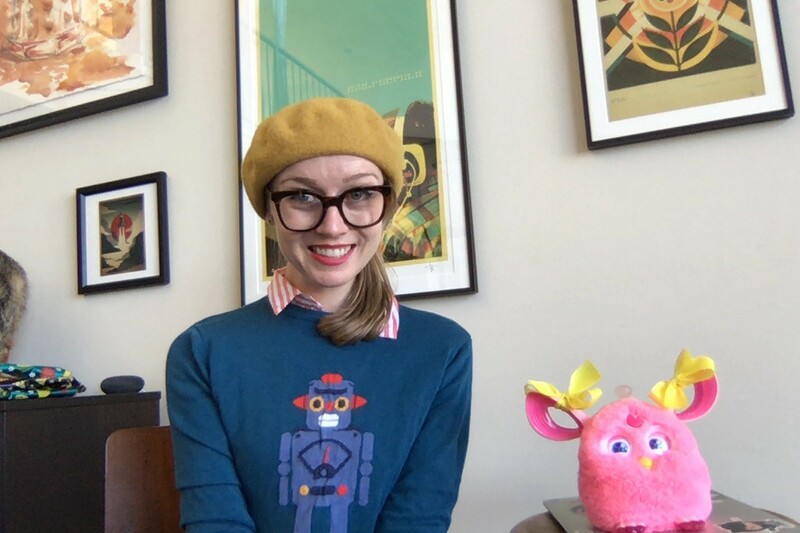 I’m hoping to spend some time over the next month creating a Furby piano to make this less painful and slow (since you have to retype and submit it each time- see video for an edited version). If you’re looking to go deeper, I highly recommend checking out the documentation and playing around. All of fluffd is open source and on GitHub- so do check it out and play! Next up, in addition to creating a Furby piano, I want to figure out the logistics of adding my own audio files (as featured in the original video), as well as eye graphics. Look out for posts on those soon!